“Life is not a straight line.” primephonic’s Rina Sitorus speaks to the gregarious French pianist Jean-Efflam Bavouzet about his not-your-everyday musical journey in a very engaging and horizon-expanding conversation. How did your journey start? 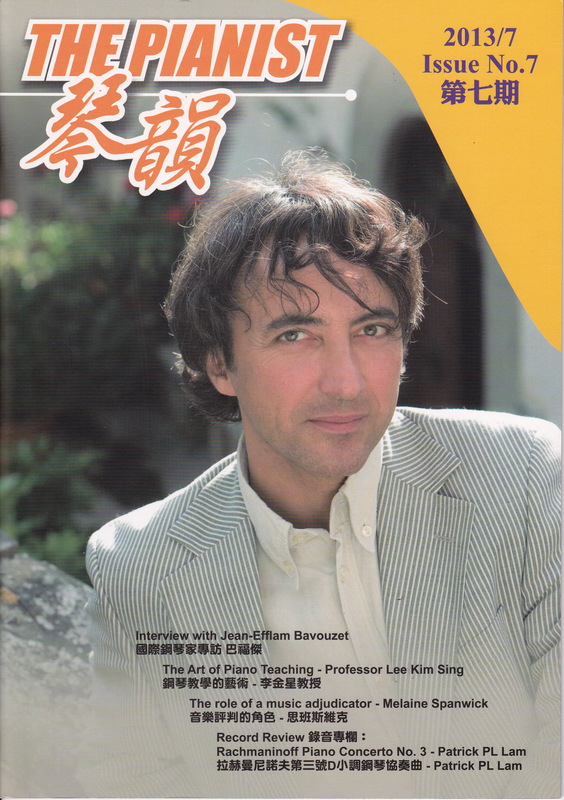 You chose piano when you already had your diploma from the Paris Conservatoire. Were you not ‘too late’ to make the decision after studying oboe, percussion even some electronic music? 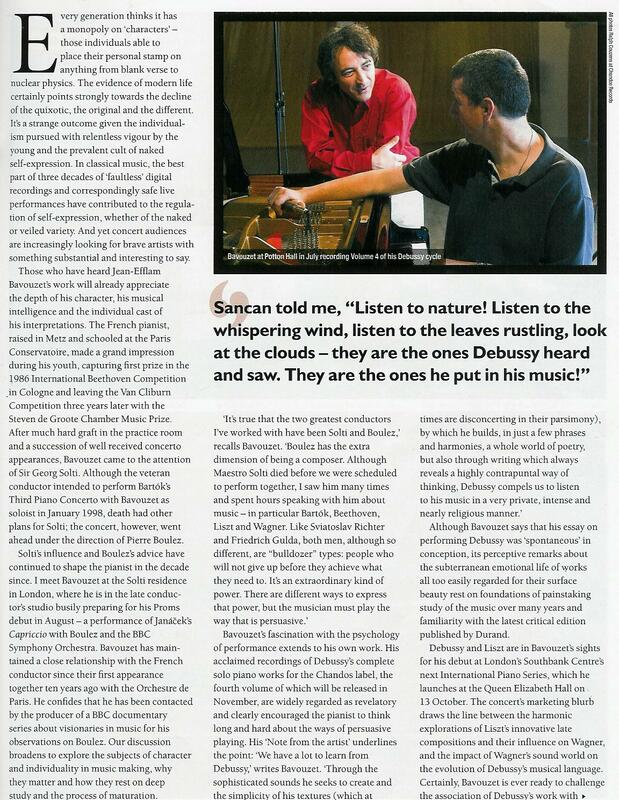 I was a student of Pierre Sancan at the Paris Conservatoire. 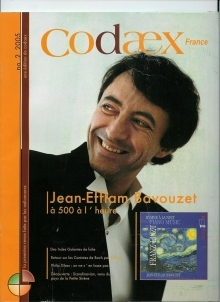 Not only did he give me precious information about the approach of the works of Ravel, Haydn, Beethoven, etc, he also taught me how to practice and to enjoy practising. He had a very rational approach of piano playing. 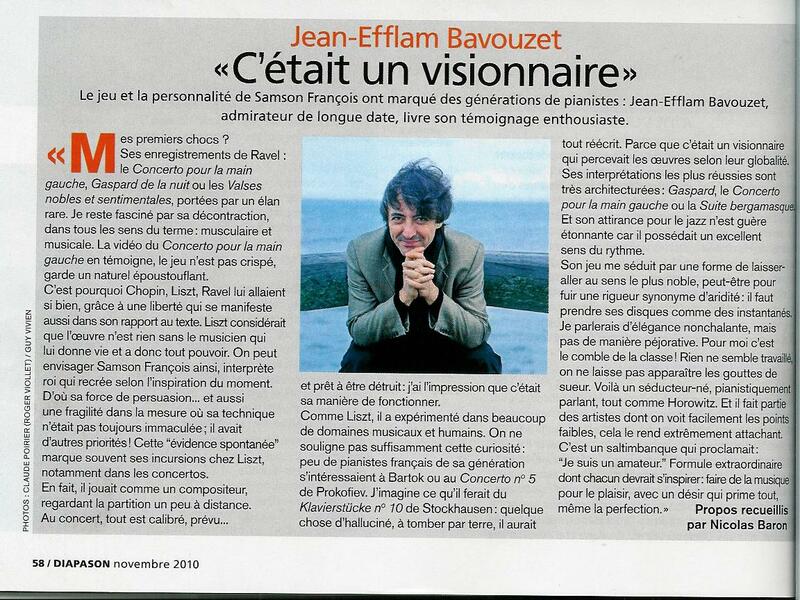 He was also very open minded, for example regarding jazz and improvisation. Back in the 80s you could not play two chords of jazz, but Sancan was different. I remember when we were alone in the class, he was even improvising himself. 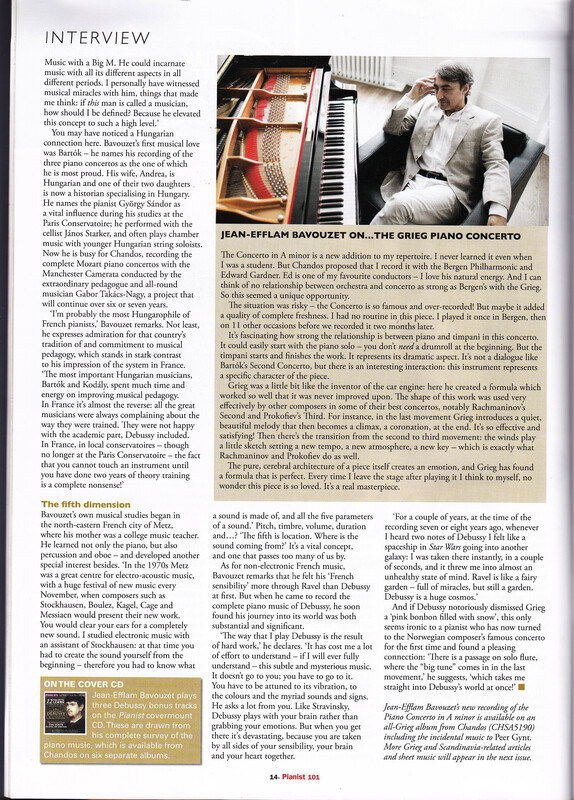 At times we even had two-piano improvisations. Not always, but sometimes. That was really a turning point for me. And 15 years later, I met this wonderful late (Hungarian) pianist Zoltán Kocsis. 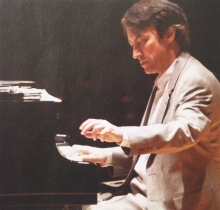 Having to play a thousand of concerts with him has also shaped my piano playing. Although… I didn’t have the feeling that I had to make choices. I was definitely not thinking in terms of career. For example, I learned to play Prokofiev No. 5 because I adore it. When my colleagues were learning Rachmaninoff, Tchaikovsky or Prokofiev No. 3, not only because those are great works, but also because audience like to have them performed, I was learning the pieces I adored. If i had a chance to play them, fine, if I didn’t, fine (chuckles). Just as I dared to play Stockhausen’s Klavierstück for my debut in New York and Paris back in 1987, when even for that time Stockhausen was considered as very avant-garde. Such a nonchalant approach, do you think it will still work in today’s classical music scene? 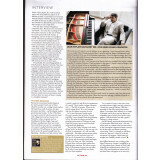 It is true that the situation has changed now for young musicians, it gets tougher and tougher every time. The environment is very competitive these days. 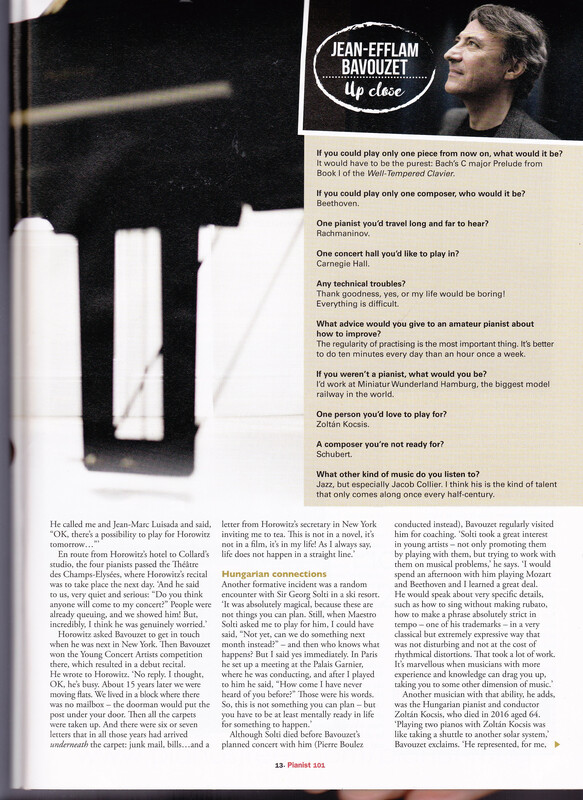 Yet, sometimes I think young pianists are almost too focused on career or thinking in commercial terms. Now that I’m busy with concerts and recordings, I still think to myself every morning how lucky I am. I have never planned my career too meticulously. Not at all, not at all. You were Sir Georg Solti’s (Chicago Symphony Orchestra Music Director 1969- 1991) ‘latest discovery’. Could you share with us how it happened? Again, it is interesting because we can speak a bit about the luck factor in life. I think everybody who is really successful in any field, has to do with pure luck. But, in order to get the pure luck, you need to work very hard and you definitely have to have the right kind of mind. When I met Sir Georg Solti by pure luck in a shop in Switzerland and when he was coming to Paris a couple of months later and asked me to play for him, I jumped on it, I made sure I was mentally ready for it. What I mean by that, is that the luck factor has a lot to do with speaking to other people as well. If you were for example an introverted type of person, your chances of having such luck in your life are reduced. Back to Solti, it was incredible. Five years before (in 1992), I was at the Esther Honens Competition in Calgary, which I won. The director of the competition was Andrew Webber. Andrew asked me, where do you see your career in five years from now, and I was absolutely speechless, I had absolutely no plan and no clue. Who would’ve guessed that I’d be playing for Sir George Solti five years on from that time? (chuckles). I played for Solti several times in Paris and at his home in London. Each time it felt like a master class, an incredible exchange. Then in June 1997, Solti agreed to add me as his soloist for concerts in January 1998 that include Bartok’s Piano Concerto No.3. 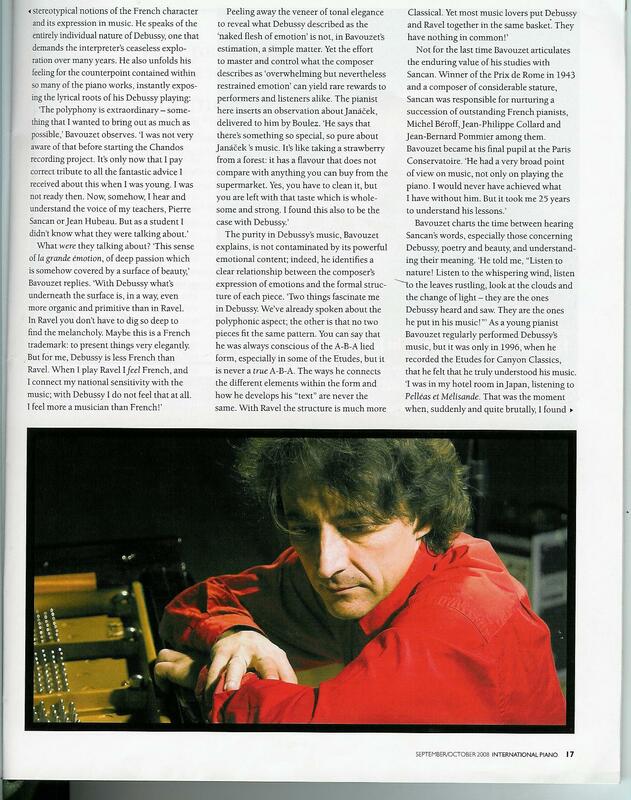 It was so sad that the maestro died in September. I never got to be on stage with him, but I had the great fortune of spending many musical afternoons with him. 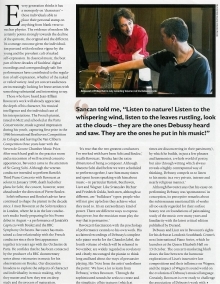 It was enriching: personally, musically and also for my career. You know, I’m very proud, his widow gave me one of his two tailcoats. I’m not wearing it so much anymore, because Emanuel Ungaro designed a wonderful costume for me, but I still cherish it with all my heart. 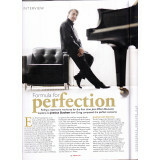 No meticulous planning, meeting the maestro by pure luck, has it always been so carefree for you the whole time? Here is the funny thing, please always remember that life is not a straight line. I was struggling with functional dystonia for three years when my right hand was afflicted. If you are, for example an athlete, you have an army of physiotherapists looking after you every day, but for us musicians it is different. At least for me at that time it was. 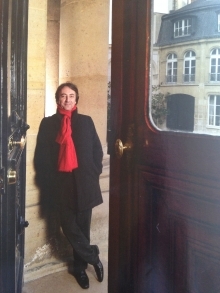 I was incredibly fortunate to meet a person who could cure me, Philippe Chamagne. It was difficult to face, also mentally. I just started my career, I just started to join competitions, then I realized I couldn't play two octaves in a row, haha what do you do? So as Solti always told me, nothing will happen when you give up, it is the only thing which is absolutely sure. And there’s always room at the top, there’s always room for excellence. So I chose not to give up. What motivated you at that time? Seriously, I was ready to give up entirely. What's the point? In this case, you have to search deep inside yourself, to see what motivates you. 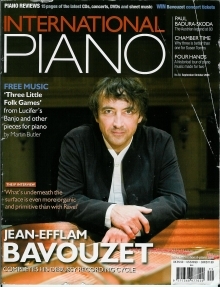 What I was sure about, if I ever overcome this challenge, was that I would become a better pianist. So I worked very very hard to get better. After that, I could play 4 or 5 Prokofiev concertos in two nights in 2000! I was not even tired. I would be now, of course…(chuckles). Have you become more critical towards yourself after all these years? Worse! In one sense it’s a good sign, but in another sense it leads to a lot of frustration. Music is an endless search. It can always be more beautiful, there’s no limit. 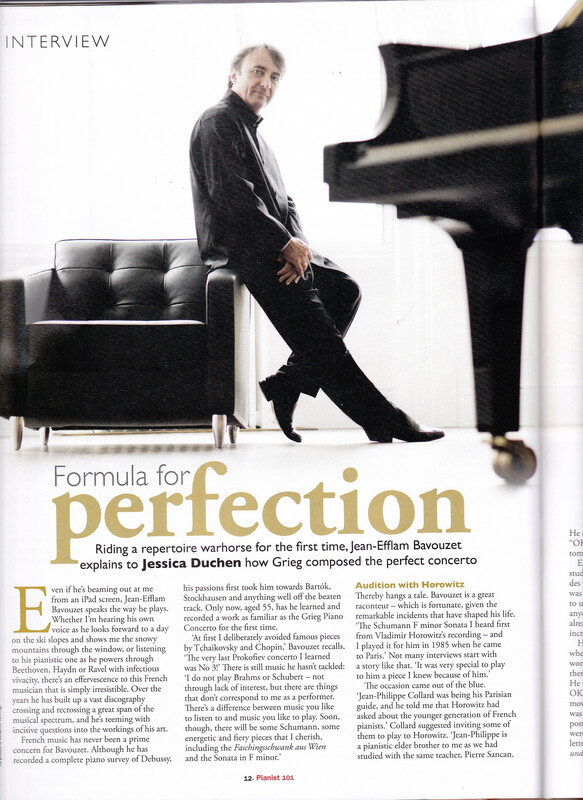 The proof is, if a composer so satisfied with his work, he’ll stop composing. On another level, it’s the same with us musicians, we want to be closer to the intention and to reveal to the audience all this beauty that we can see, which the public not yet can see, so we have to transmit them. Do you prefer live performance or recording? Pierre Boulez told me that every concert is a mini miracle. Because literally anything can happen. I wouldn’t call it a communion because it makes it sounds so religious, but when so many people are intrigued, moved, or challenged by this particular organisation of sound in time, which is what music is, the power is very strong. On the other hand, I also like very much the perfection you have in the recording environment. I love recording process, I really follow it from A to Z. I listen to all takes whenever time allows. I also like the intimacy of a recording studio. The intimacy you have with the music, with the composer. Of course there’s no contact with people, but also in a way, you play for nobody but you play for everybody. Because even more today than in any other time, most people listen to music alone with their wonderful headphones. 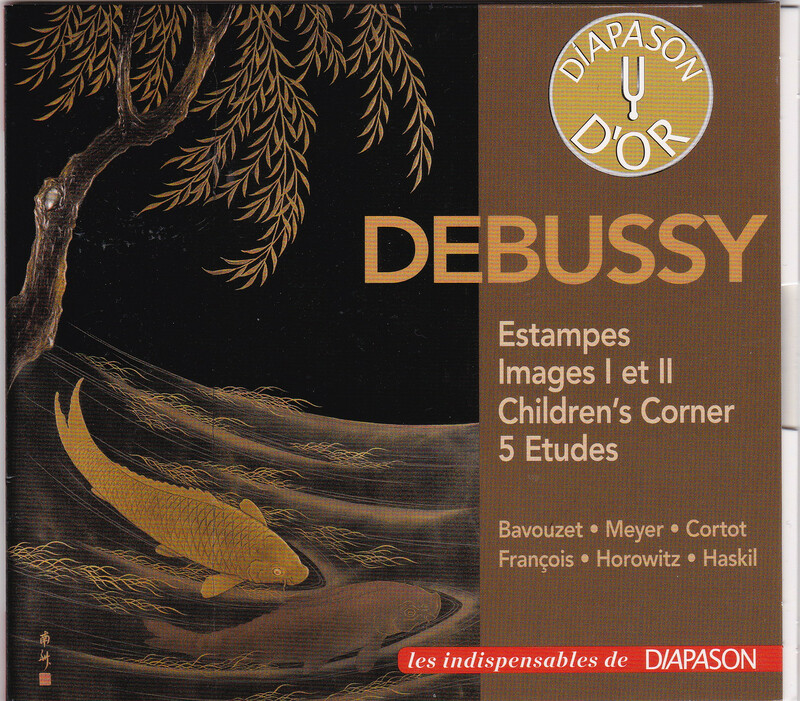 For example, the music of Debussy fits very well in recording scene, because Debussy himself said that his music should be shared between four eyes only. It can easily be lost or destroyed in a big concert hall, because it is as if somebody was whispering to you, you need to hear all the details. Do you still feel the difference in the audience in different places? A great concert is never without a great audience, and they all express themselves differently. In the Netherlands, everybody stands up. In Japan, everybody is incredibly quiet, they clap like crazy at the end. In the US, if they like something, they shout bravo and make a standing ovation. In Brazil, when they are happy, they shout your name! Could you tell us your most memorable audience reaction on your show? 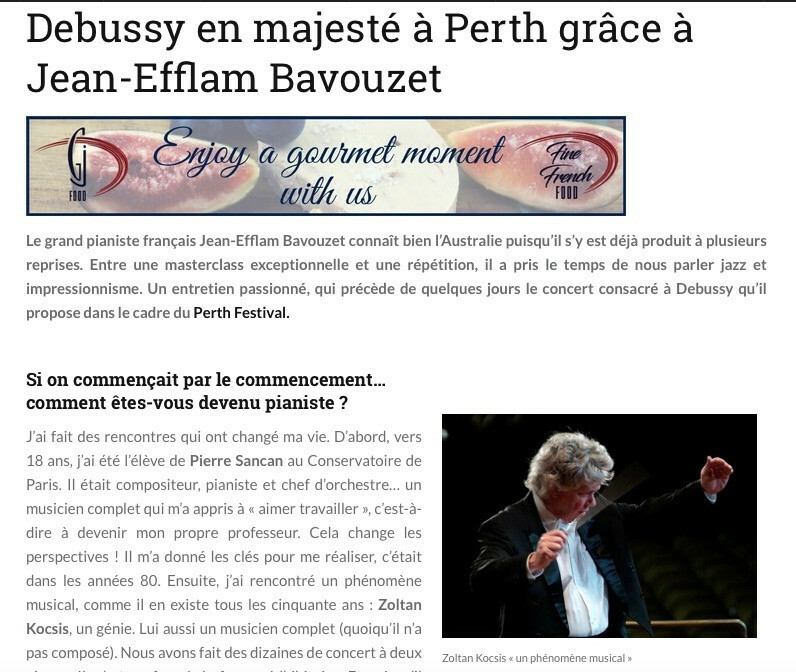 I remember one time when I was playing in the US, the 12th Debussy Etude. I was explaining a bit to the audience about the work. One of the etudes is based on tonalities coming from different distances. 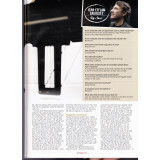 It is a very quiet piece, very slow, nothing virtuoso. I remember, when I played, people were clapping. It was the first and only time that people clapped before the piece was finished. Then I realized, people clapped because they finally could make the connection with my explanation. 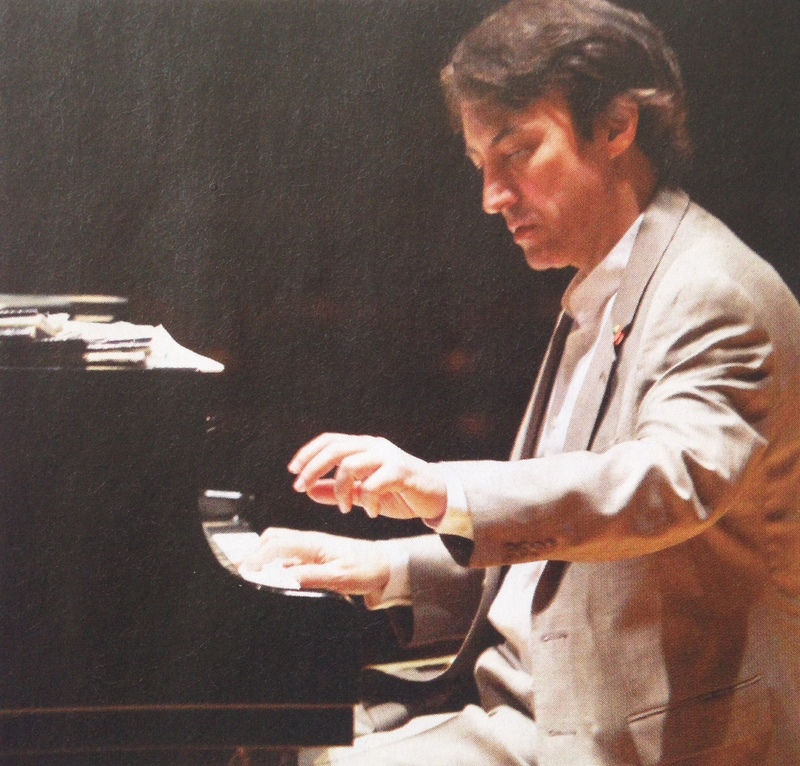 Another memorable thing, when I was in Seattle, I was playing Prokofiev’s Concerto No. 4, it’s not a very successful piece for the audience, as most people are just lost after it's finished. But I really like it very much. It was after their football team had won the Superbowl. The orchestra kindly gave me a jersey signed by all members of the orchestra. So I played the concerto, I bowed and I came back on stage wearing the jersey, and everybody went wild. I said to myself, savour this moment, because never again you’ll have such a warm applause for your Prokofiev No. 4 Concerto (laughs). 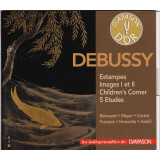 You can’t be separated from your spectacular recordings of Debussy. 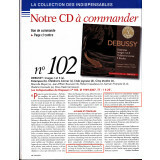 Why the complete piano works of Debussy? 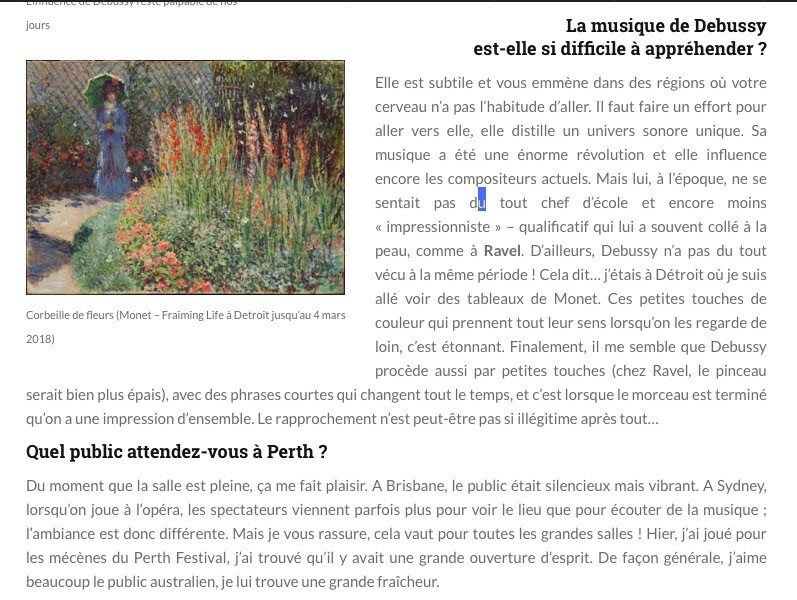 It is also something interesting, because it seems very normal for everybody to assume that because I’m French, I have affinity with French music. This is completely wrong. 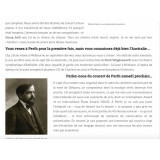 When I was learning with Cansan, I was close to Ravel, not to Debussy. I had the feeling that I missed something. 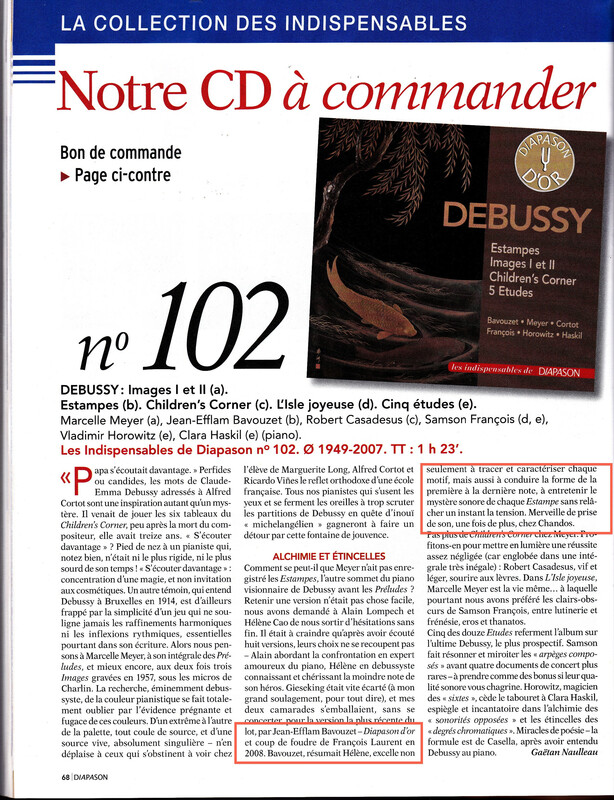 The greatness of Debussy was hidden for so long from me. Only much later in life I finally got the lightning effect. 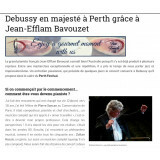 And from that moment on I worked a lot on Debussy. I got emotional and I felt like I had so much to catch up on. You are recording exclusively for Chandos. What’s coming up next in the series? I’m in the middle of the complete Haydn sonatas, I have another six albums to record. I just finished the Beethoven sonatas. We’ll be starting a new Mozart series with Manchester Camerata. Actually I just received the second album today. Hahaha, can’t you tell I am in a very good mood? It’s really very nice. What can we expect from the Mozart and Haydn albums? This Haydn volume 6 is special. 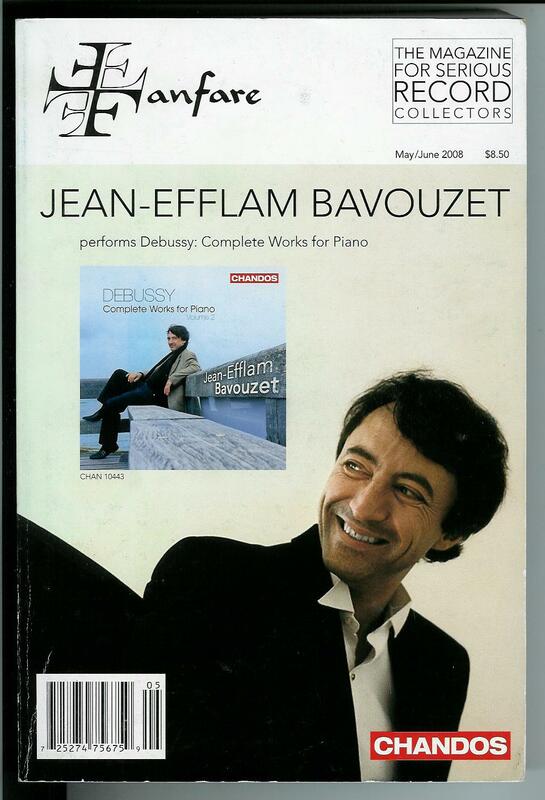 I stopped between volume 5 and 6 for a long time because I wanted to concentrate on finishing the Beethoven sonatas. Altogether, the late Beethoven sonatas are in a completely different language than the Haydn sonatas. So when I came back to work on it, I came with a new enthusiasm. I hope you can hear the enthusiasm and the freshness. With Mozart, what we are trying to do with the conductor Gàbor Takàcs-Nagy is to bring as much operatic character as possible. As if there is some mini operatic drama in the music. We played with a reduced orchestra. The Manchester Camerata was playing like little devils. They had to match the power of a full orchestra. They played with such intensity and I was happy to hear the result this morning. 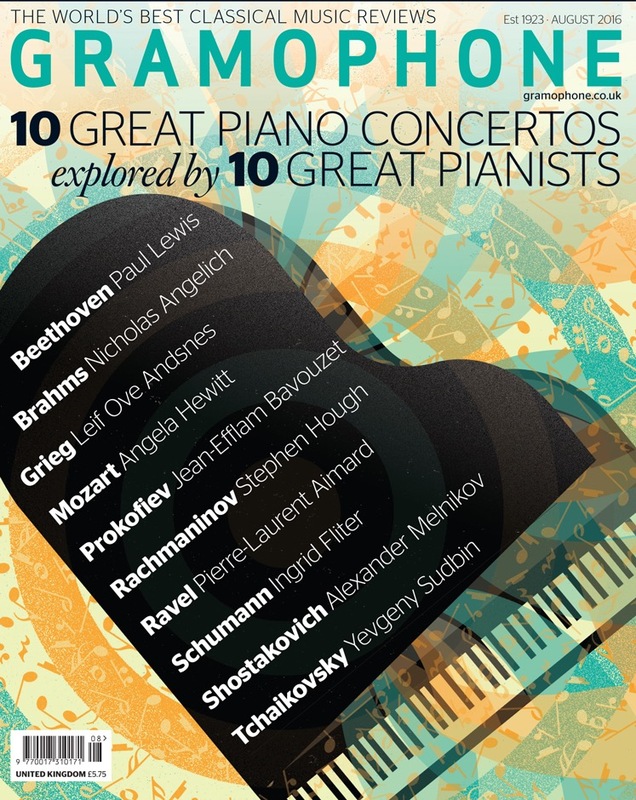 ….And in spring there’ll be the Greek concerto, with the wonderful English conductor Edward Gardner and the Bergen Philharmonic Orchestra. And there might be some other solo albums. I’ll also record Beethoven concertos with the Swedish Chamber Orchestra where I will play and conduct the orchestra. 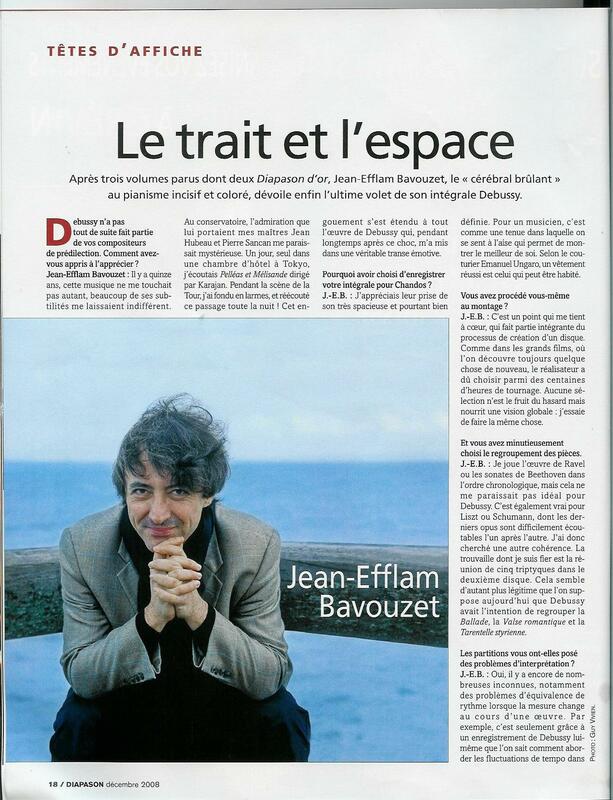 Jean-Efflam Bavouzet in conversation with Primephonic's Rina Sitorus. 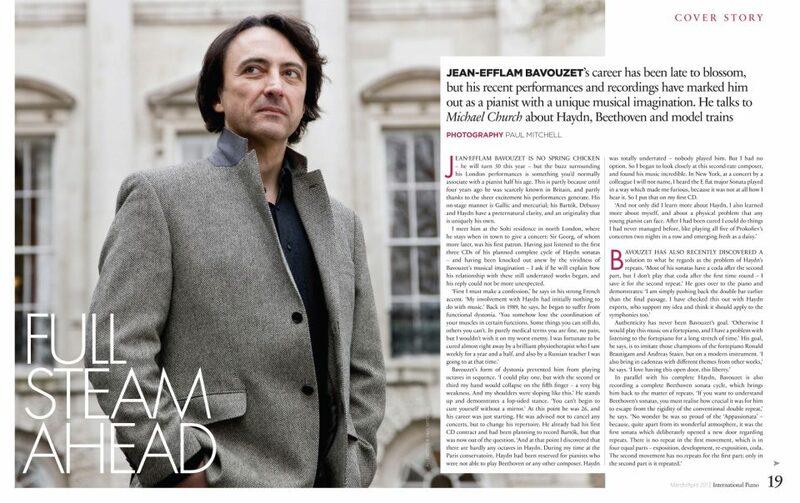 Jean-Efflam Bavouzet will be playing Janacek, Bartok and Lutoslawski with conductor Edward Gardner in Amsterdam Concertgebouw, 20 January 2018. 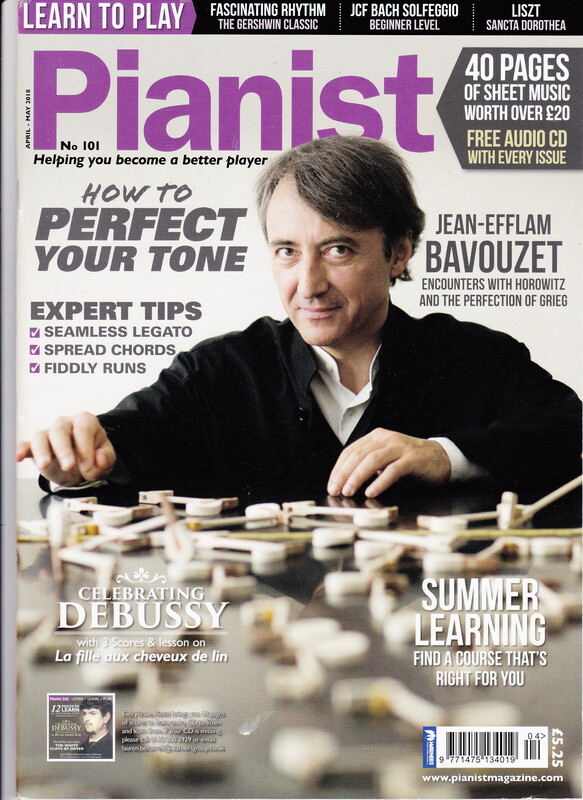 Ask for his thoughts on Haydn or Beethoven, Bartok or Debussy, and the brilliant French pianist pinpoints exactly how their demands need to be addressed. Jean-Efflam Bavouzet is interviewed by John Terauds on August 7th 2012. 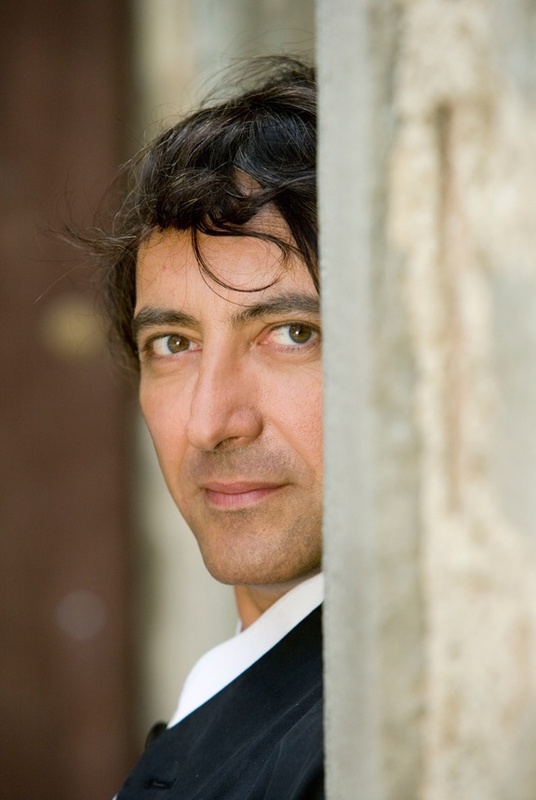 French pianist Jean-Efflam Bavouzet plays Haydn and Debussy at Stratford Summer Music on Wednesday afternoon (Henry-Fair photo). Never write off an artist because they are a late bloomer. 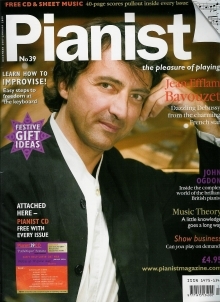 French pianist Jean-Efflam Bavouzet won his first competition in 1986, and quickly gained the respect of anyone who heard him play, but it took nearly two decades for the wider classical music world to fully catch on to this performer’s prodigious talents, which will be on solo display at Stratford Summer Music on Wednesday afternoon. 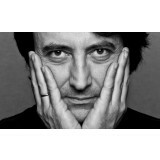 Bavouzet’s St Andrew’s Church recital is all about Impressionist master Claude Debussy, with a little bit of Joseph Haydn thrown in as an amuse-bouche. 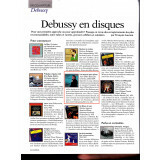 A lot of people play Debussy and Haydn, as well as Ravel, Beethoven, Bartók and Schumann and Liszt. But very few manage a total act of self-transformation in the process. For example, Bavouzet’s Debussy interpretations are all about depth of sound and colour, while his Ravel playing displays remarkable finesse with shimmering surfaces (“Ah, but Ravel is a classic composer, while Debussy is a revolutionary composer,” says the pianist during a post-rehearsal chat on Monday). 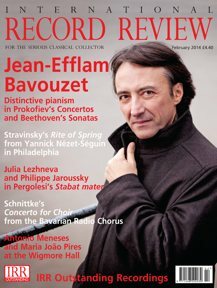 His Haydn has an astringent clarity about it, while Beethoven sonatas emerge with messy Sturm und Drang mixed with tenderness — much like the ink-splotched scratches that strain the composer’s manuscripts. 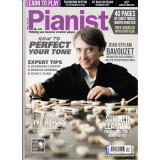 Unlike so many pianists — including international stars — who approach music with a personal consistency, Bavouzet takes on each composer as a separate interpretive challenge, with distinct results. 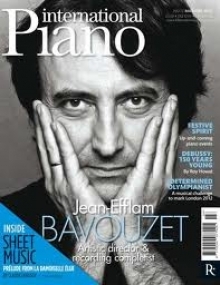 “For me, a great pianist is a pianist who can completely change his clothes,” says Bavouzet. “Of course, you can’t transform the flesh completely, but a great actor can create completely different characters,” he says by way of analogy. 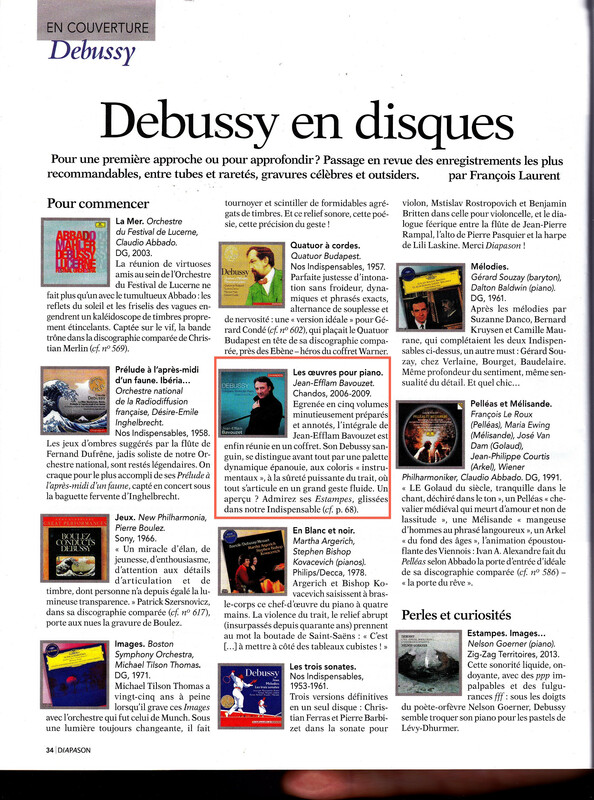 He admits that the first time he truly felt clueless in front a piece of music was Olivier Messiaen’s Réveil des oiseaux. Fortunately, Yvonne Loriod, Messiaen’s second wife and chief interpreter of his music, was still alive. “I went up to her apartment and we had a wonderful afternoon of work together, and she explained everything to me. But without her wonderful help, I think I would have had to cancel the concert, but it was with the Boston Symphony, so it would have been a bit stupid,” he says, laughing. 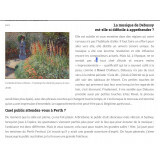 “Every extra piece of historical or musicological information you can get is helpful. But it should help you to be free,” he insists. The key that unlocked that appreciation was the tower scene from Debussy’s opera Pelléas et Mélisande. He was sitting in a hotel room in Japan, preparing for his recording of the Debussy Etudes, and had brought with him a classic recording of the opera with Herbert von Karajan conducting. At that moment in the opera — “perhaps because I was away from home, I was more solitary, more perceptive” — he put the headphones on and began to cry. Quite frankly, it sounds like Bavouzet would put even the most determined of Hollywood’s Method actors to shame. The second half of the programme is different from the one announced by Stratford Summer Music. 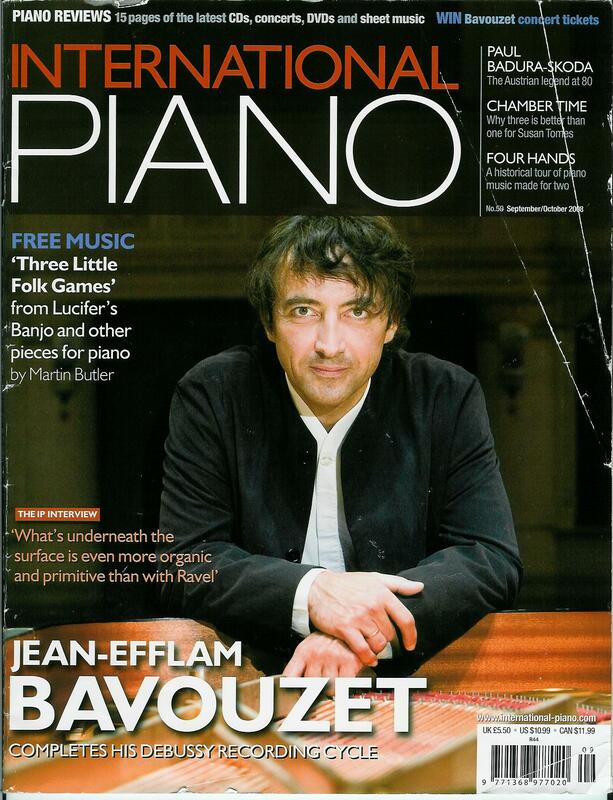 Bavouzet is replacing first six Préludes from Book II with his own two-piano transcription of Debussy’s ballet suite, Jeux, which he has now adapted for piano solo. 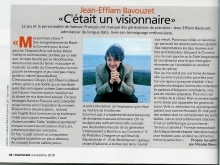 Jean-Efflam Bavouzet semble aujourd'hui au faîte de son art. 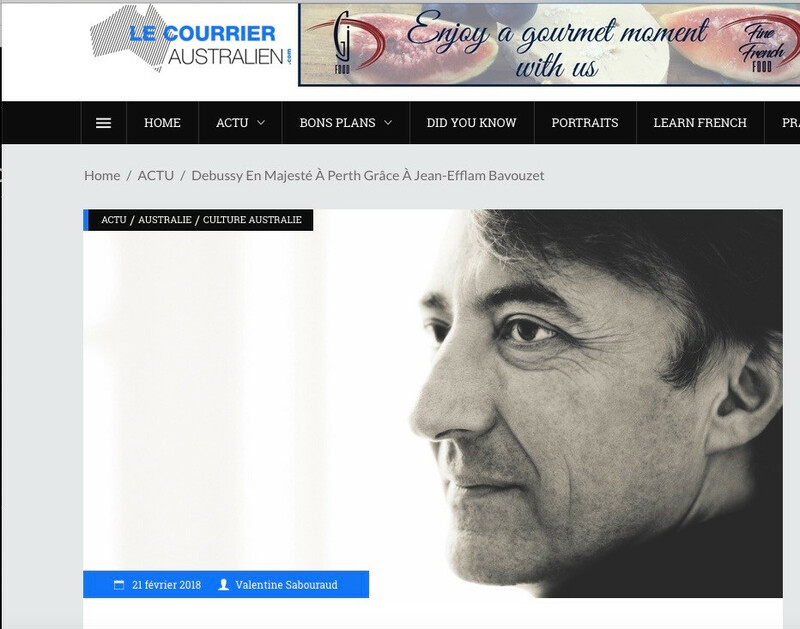 Hôte régulier du Festival international de piano de La Roque-d'Anthéron (Bouches-du-Rhône), Jean-Efflam Bavouzet y interprétera les 31 juillet et 1 août l'essentiel de l'oeuvre de Debussy, qu'il a par ailleurs brillamment enregistrée. 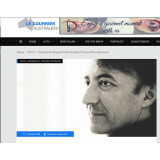 L'International Classical Music Awards l'a en outre nommé artiste de l'année en mai en reconnaissance de sa « curiosité singulière » et de sa « lecture renouvelée des partitions ». 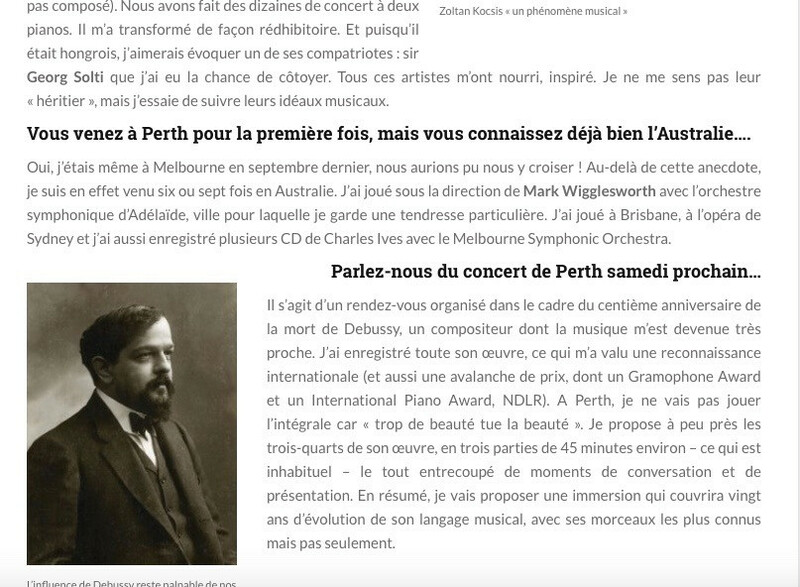 Si le grand public le connaît mal, l'artiste bénéficie d'une enviable renommée parmi les connaisseurs et il mène une carrière internationale dans les salles les plus prestigieuses du globe, de Londres à Boston en passant par Sydney et Berlin.